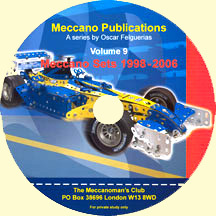 The Series is a compilation of Meccano publications - instruction manuals, catalogues, technical manuals and ancillary material from the birth of Meccano to the present. Over 700 publications will be included in 12 CD volumes, scanned at high resolution for on-screen viewing or printing, and fully indexed. The 4 Volumes covering the period 1970 to 2006 will also provide a comprehensive history and details of the sets, manuals, new parts, parts lists, colour schemes and packaging of each period. Meccano Other Publications – Includes Standard Mechanisms, New and Prized Model Books, 1920’s Electrical Outfit, Instruction Leaflets for Motors and Special Model Leaflets. Each of the sets of the period - Standard Sets, one-model Starter Seriess, Dynamic Series, Collection Series, Action Control series, Mission the Universe series and Special Sets - has a dedicated section with data sheet, parts list and hi-resolution scan of the complete instruction manual, and ancillary sets and products are also included. Appendices contain illustrated indexes to sets (by number, set series and date), conversion tables for new/old part numbers and illustrated lists of new parts introduced. 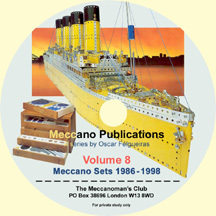 This 2277-page Volume has sections on Meccano history of the period, sets, instruction manuals, part numbering systems, new parts, colours and packaging. Introductory material provides an overall view of the period, and a detailed overview of each set series within it. Each of the 139 sets of the period has a dedicated section with data sheet, parts list and hi-resolution scan of the complete instruction manual.